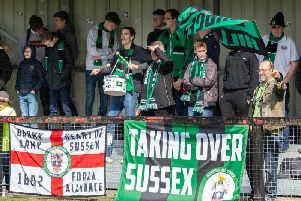 Incisive in attack throughout, Uckfield commanded from the start, as two headed finishes and a second-half double salvo saw them to midweek victory at Eastbourne United, reports Will Hugall. Boosted by the return of Louis Rogers, Callum Sheriff and Dee Okojie – having each been unavailable for the previous weekend’s 1-1 draw with Loxwood – Uckers manager Anthony Storey gave way alongside Josh Langley-Fineing and Craig Norman in three of his four changes; Shaun Loft also replacing the unavailable Steve Hickman-Smith. With both sides winless beforehand, intent to overturn slow starts showed early on, and culminated in an opening goal of relative ease for the visitors; in the 9th minute, from a Sam Cooper throw-in, Callum Smith winning an initial flick-on, and Matt Black directed his header beyond the United goalkeeper Luke Colquhoun. As Bailo Camara chipped an enticing cross onto the United crossbar in the 37th minute, a flurry of Uckers pressure followed, with Okojie’s laced strike forcing a stretching block from Jack Harris. It was in this burst that a second goal also arrived, through Ellis Cormack’s left-wing delivery to Loft, who provided a trademark powered header back across goal to double his side’s half-time advantage. Exerting noticeably higher pressure from the restart, the Uckers aimed to pounce on insecurities the home side would have to surrender, if to regain parity. While Cormack fired wide, and Okojie prised a powerful punch away from Colquhoun from 25 yards, opportunities were otherwise scarce, with the hosts unable to break far from their own half. Once breaching a lax Uckers backline, however, in the 65th minute the hosts unexpectedly halved their deficit; Jordan Woodley’s touchline cross from the left freeing striker Luca Page to control, 10 yards from goal, and lash home a left-footed strike. Punished by earlier opponents at such a stage, Storey’s side would avoid any further scares when Callum Smith was gifted a finish in the 70th minute; after a tackle on Black ricocheted behind the home defence, the striker dispatching with a clinical finish into the bottom right corner. Only a minute later, victory was assured, with Black doubling his personal tally after following up a low Okojie effort that Colquhoun was forced to palm away, and blasting ruthlessly into the roof of the net. As serious intent was promoted from the bench, the visitors were frustrated not to add further gloss to victory as they continued to dictate tempo until the final whistle; Bright Temba excelling, and Camara unfortunate not to execute an outrageous late flicked finish. Returning to FA Cup action, Uckfield host Harrow’s Broadfields United in a historic Preliminary Round tie this Saturday, kicking off at 3PM at The Oaks.